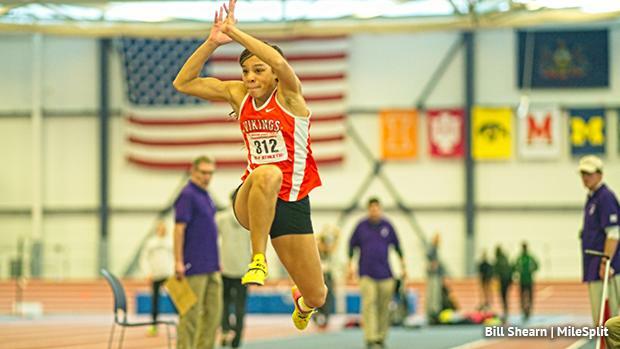 Christina Warren emerged onto the scene as a freshman and the versatile Perkiomen Valley jumper and hurdler immediately made her impact known. Now a senior bound for Arizona State next year, it's just been an upward progression since then for Warren in every event. Perhaps her best event is the triple jump, a discipline where she's already won three state titles (2 outdoors, 1 indoors). Last winter, was undefeated up to and including the state meet in the TJ, launching her indoor PR of 40-10.75 at Penn State to claim her first indoor state crown. She had a very consistent outdoor season that led to an all-conditions PR of 41-01.5 and a number of other leaps well over the 40-foot mark. She holds the top returning jump in PA by over two feet and will once again be the odds-on favorite to win another state title this winter. She's also the nation's No. 2 returner this indoor season, trailing only reigning indoor national champ Jasmine Moore of Texas. Inara Shell of Friends' Central was a freshman that, like Warren three years ago, emerged onto the runway with a bang. Shell put down a PR leap of 38-04.5 at the indoor state meet last winter, placing third. She closed out her ninth grade year with a PAISAA title and then a jump over 39 feet in AAU over the summer outdoors. Shell is one to watch this year. Jayla Bernard of Saint Basil Academy is another returning medalist. She claimed eighth at indoor states last season. She comes in with a best from last indoor season at 37-00.75. She was fourth in AA at outdoor states. Three others return this season with jumps over 36 feet. Penn Cambria's Lyric Janosik (ninth at indoor states), Ridley's Meghan Lynch (15th at indoor states), and Central Dauphin's Gabriella Recce (12th at indoor states) will all be shooting to move into the medals this season at the state meet. Mastery Charter's Taliyah Furtick and Conwell-Egan's Theresa Richardson are among the other state qualifiers from a year ago that are also back this season.